Antonio y Cleopatra Cigars Special Pricing Promotional Deals - AyC Mini Dark Special Pricing Promotional Deals | Antonio y Cleopatra Cigars available are Antonio y Cleopatra Corona Dark Cigars - Antonio y Cleopatra Grenadier Light Cigars - Antonio y Cleopatra Grenadier Dark Cigars - Antonio y Cleopatra Mini Dark Cigars both in packs and boxes. Antonio y Cleopatra cigars have been around since 1879 and have risen to be one of the most popular brands on the market. 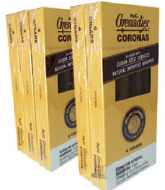 Today, these low-cost cigars offer a mild and satisfying flavor rolled in your choice of Connecticut Shade natural, Broadleaf Maduro, and Indonesian wrappers. Machine-made in Cayey, Puerto Rico, the filler tobaccos are all Cuban-seed with a sheet binder. Antonio y Cleopatra Cigars available are Antonio y Cleopatra Corona Dark Cigars - Antonio y Cleopatra Grenadier Light Cigars - Antonio y Cleopatra Grenadier Dark Cigars - Antonio y Cleopatra Mini Dark Cigars both in packs and boxes.